﻿ Security Links: An Emerging Congressional Common Ground on Climate Change? As regular readers of the New Security Beat know, this isn’t DOD’s first rodeo with climate security connections (see actions in 2010, 2014, 2016). In fact, the amendment quotes high-ranking military officers—including current Secretary of Defense James Mattis and Chairman of the Joint Chiefs of Staff Joseph Dunford—describing the impacts of climate change on military readiness and national security. “America’s military leaders recognize that climate change acts as a threat multiplier, with sea-level rise, drought, and extreme weather leaving vulnerable populations desperate for food, water, and shelter and aggravating the conditions in which terrorism and political and economic insecurity breed, ” says Sherri Goodman, former under-secretary for defense (environmental security) and current Wilson Center fellow. However, given the United States’ withdrawal from the Paris Agreement, the bipartisan Congressional resistance to efforts to block the amendment is significant, and a clear win for both the climate and security communities. While increasing the military’s readiness to respond to the threats posed by climate change is an important step, we will need other government actors to prevent those threats from endangering American lives and our national security. Without similar bipartisan support for a whole-of-government approach, climate change’s impacts on fragile states will quickly outstrip and outpace the military’s ability to respond. The other two “D”s–diplomacy and development–in the “3Ds” of foreign policy are essential to tackling the climate change and security nexus. Already, we are seeing climate effects both at home and abroad, including more severe and more frequent extreme weather events and changing patterns of precipitation, leading to floods, famine, and displacement. These effects are felt most acutely in some of the world’s most vulnerable places, like Syria and the Sahel, where institutions are weak and leaders are unable or unwilling to respond to these crises. 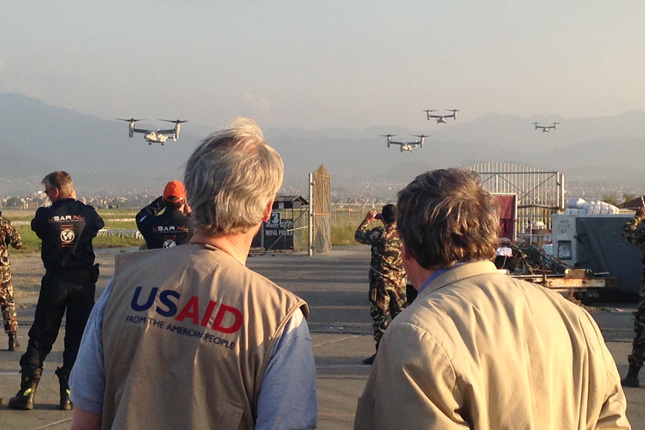 USAID and the State Department—the U.S. government agencies that lead development and diplomacy—need to be part of the American response. Working with other governments, IGOs, NGOs, and communities, this coalition can increase the resilience of vulnerable populations, making them better equipped to adapt to climate change and withstand shocks and stressors. A military response to climate-related instability should not be the only tool we pull out of the box. The bipartisan support of the Langevin Amendment is an important first step in building a shared consensus on climate’s security risks. It will have even greater impact paired with support for improving climate adaptation in fragile states, so that our military will not be the primary agency on the front lines of fighting a changing climate.